Composer J. Anthony Allen and I are currently showing the latest edition of Urban Echo in Copenhagen for the ICMC conference. While our original desire to creatively reflect and transmit the desires and thoughts of local city-dwellers has remained, each new location has suggested a different approach. The installation in the courtyard of Huset i Magstræde in downtown Copenhagen is no exception. In this latest installment, J. Allen and I have tightly coupled the audio and visual components and worked to make the projections more “sensitive” to their façade. For example, when text and images are moving about, they respond to the presence of architectural features such as doors and windows by avoiding or bouncing off of them. A quick look at the images or video will make this a bit clearer. It’s a Danish number, but international text messages are pretty cheap. So go for it! UPDATE: I.D. Magazine Visitors — more images can be found here. 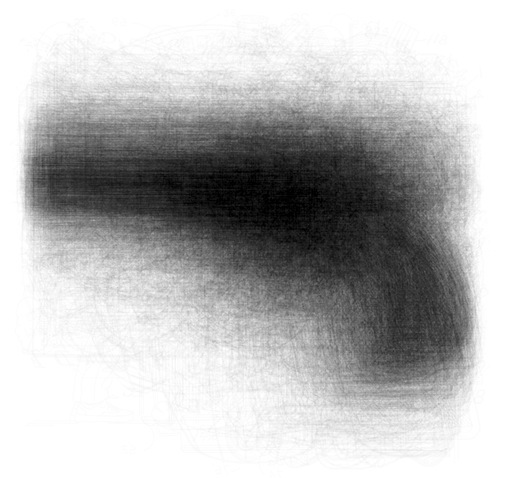 This sketch was created by combining images from every United States patent containing the phrase “toy pistol”. The earliest image dates back to the mid 1800’s. I recently developed an application for interactive patent database visualization and navigation. It’s still in progress but I thought I’d post a couple screen shots. It’s the standard mass/spring ball/stick network visualzation, which isn’t terribly intuituve or efficient, but it’s a start. This interactive program is written in Processing and uses various online patent databases. Currently it allows several interesting group selection operations including tag cloud generation, date, inventor and class-based organization. I’ll post more pictures and an online demo soon. The audio and video were recorded live at the event on 6 October, 2006. You are currently browsing the archives for the Documentation category.